Photo credit: John Ragai at Flickr Creative Commons. Today is the first day of Lent, a Christian tradition in which followers of the faith give up a highly beloved possession or habit for 40 days in honor of of all that Jesus gave up during the 40 days he spent wandering the desert. 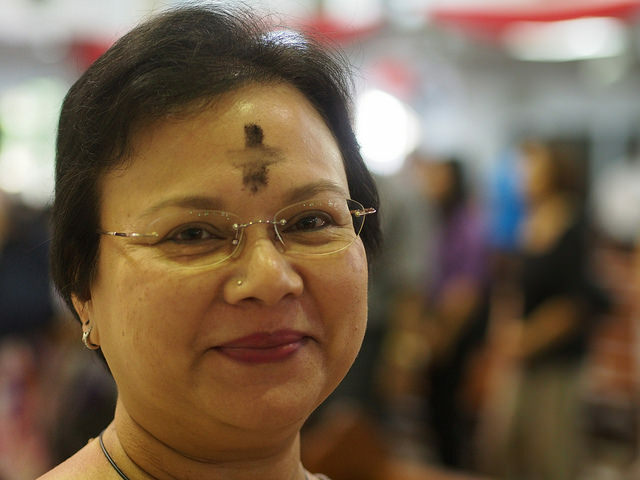 Ash Wednesday, the first day of the season, is for reflecting upon the sacrifices made for our sake. It is a somber holiday, named for the ash that celebrants wear in honor of that sacrifice. If you spot a sparkle of purple glitter in the dark mark on someone’s brow this Ash Wednesday, do not think that they’re making light of this tradition. They are not wearing that sign for attention or for levity. They’re wearing it to make it clear that they believe that Christianity includes the LGBT faithful. That they are good influences on us all, and that Jesus Christ’s sacrifice was for their sake as well. Despite a majority narrative that there is no place for queer people in Christianity, there are millions of faithful, religious people who are also gay, lesbian, bi, and transgender. They struggle with inclusion from anyone. Churches call for the shunning, shaming, or in extreme cases, outright execution of LGBT people. Religious families turn their backs on their gay sons, shame their bisexual daughters into suicide, refuse to acknowledge their lesbian daughter’s wives, or deny their trans child the help and clothes they need to be themselves. And the queer community all too often demands that they leave their God at the door, preventing them from finding inclusion there, either. Glitter Ash Wednesday is a message that needs to be sent out: that queer Christians have a place in both of these spheres. The glitter is not only for LGBT Christians—it is for all who call them part of their family. It is a statement that there is nothing about being LGBT that makes one any less a child of God.